This AM Donna and Baby pottered over to Grazia Magazine's HQ to do a stint of filming for the ever expanding Grazia TV section of the style bible, Graziadaily.com. 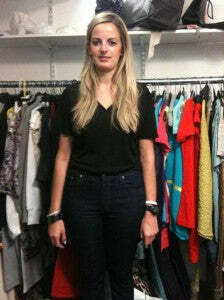 Here is a snap of Fashion Assistant Lily Russo wearing the famous NOBODY Cult Code jeans! Watch out for Donna's appearnce on GraziaTV where she dishes out advice on the season's hottetst styles and Denim Do's & Don'ts.